" . . an excellent crime novel, and an excellent historical novel. 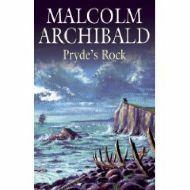 What really brings the book to life beyond the well crafted plot is the loving and often deeply grimy detail in which the Dundee of 1849 is drawn by Malcolm Archibald. The city becomes a leading character in the novel and we find ourselves navigating its often non-too salubrious streets alongside Mendick and his colleagues as they close in on a conclusion that is as shocking as it is unexpected. We enjoyed The Darkest Walk, and feel that this second in the series sees Archibald and Mendick both getting into a very assured stride to produce a novel that is even better. We also feel the setting of Dundee suits Mendick perfectly. Let's hope he's back there soon..."
"This book, set in Dundee in 1849, is the second in a series featuring Detective Sergeant Mendick, following The Darkest Walk. Sergeant Mendick has arrived from London to collect an escaped prisoner. Although born there, he has no love for Dundee and is not pleased to be retained to help investigate a series of gruesome murders. Mendick employs his considerable skills to eventually solve the case. Whilst doing so he interacts with the highest echelon of Dundee society as well as mingling with the riffraff. The accurate historical detail brings Victorian Dundee vividly alive. One can almost taste and smell the vile backstreets, see the tall hatted, blue-garbed policeman and hear the elite of Dundee talking. A Burden Shared is a terrific read, and I am eagerly awaiting the next instalment in the series. The history is accurate, the characters well drawn and the writing fast-paced and excellent. I highly recommend this book." "It is 1848 and Scotland Yard have been tracking the progress of the working-class Chartist movement. Worrying new evidence hints at a radical element, who believe violence to be their only option to secure success. The recently promoted Detective Mendick is given the unenviable task of going undercover behind enemy lines in Manchester, the heart of industrial England. Sceptical at first, Mendick quickly becomes impassioned about bettering the lives of his less fortunate countrymen, especially when it involves the mysterious and beautiful Rachel Scott. On discovering there is more at stake than just workers’ rights, the detective battles with an unknown double agent as he tries to prevent a catastrophe that would change the political landscape of Britain forever. The Darkest Walk is an accomplished piece of work by Malcolm Archibald. He gives what could be a dark and miserable subject passion and suspense. I felt involved through his account of Detective Mendick’s journey—he was a suitable hero that I found believable, as he acted as I would, and stumbled where I did. This is a bit more intelligent than many books I’ve read in this genre—I enjoyed the fact I couldn’t predict the outcome. Highly recommended." "This is a great read from a Scottish based author. Set between New York and Edinburgh (Scotland) it follows a runner-up in a TV contest as she tries to steal the Scottish Honours from under the Queen's nose. Full of fast moving action, interesting characters and good contrast between modern New York and historical parts of Edinburgh. The plot grips you from when the main character is set the challenge early in the book to the final drama. Well worth reading." "Horseman of the Veldt' is one of a series that follows the pattern set by C. S. Forester, but fortunately does a very good job of it. Not many of this type of book seies has that re-readability that is the mark of excellence, in this 'Horseman' succeeds." "A Sink of Atrocity" by Malcolm Archibald is about Dundee. Before the residents of Scotland's fourth city get too upset, it's worth making clear that this is not a book about modern Dundee. Rather, as the subtitle makes clear, this is an account of crime in 19th century Dundee. It is also worth making clear that the description is not Malcolm Archibald's. As the author says in his introduction, the phrase was first coined by Henry, Lord Cockburn. He was an eminent lawyer and judge, whose memoirs about his 17 years as a Circuit Judge were posthumously published in 1888 as "Circuit Journeys". Lord Cockburn had a thing about Dundee. As well as coming up with the memorable phrase that forms the title of this book, he also described the city as "the palace of Scotch blackguardism" and "the most blackguard place in Scotland." 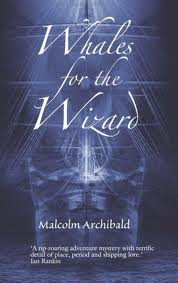 In this well written and immensely readable book Malcolm Archibald starts by looking at the changes that swept through Dundee in the 1800s, changes that turned it from a small town to a major industrial city playing a world role in jute, linen, whaling and shipbuilding. His brief history of Dundee during the century is fascinating, and highlights the social and economic factors which led to the descriptions given it by Lord Cockburn. Though, as Malcolm Archibald says, "Given the hell's kitchen in which so many lived, it is more surprising that most people remained honest." The main body of the book is divided into a series of chapters which look either at types of crime or at some of the key players in the story of crime in Dundee, whether it be the early police, or the thieves whose activities were so prominent in Dundee during what even by the standards of the century was a crime wave in the 1860s. A book of this sort succeeds or fails on the strength of the research that underlies it; the quality of the writing; and the author's ability to select incidents and stories that will appeal to his or her readers. On all three counts Malcolm Archibald has succeeded admirably. The result is a book which is genuinely fascinating, hugely informative, thoroughly entertaining (in spite, at times, of the subject matter), and in places very surprising: an early account is of the theft of a whale worth £600 (a lot of money in 1829) by the crew of one Dundee whaling ship from under the noses of another who had already harpooned it!" "This novel is quite simply a rivetting good read." "The likeable everyman hero wil appeal to readers as historian Archibald enriches the plot with interesting details pertaining to England's remote coastal life." 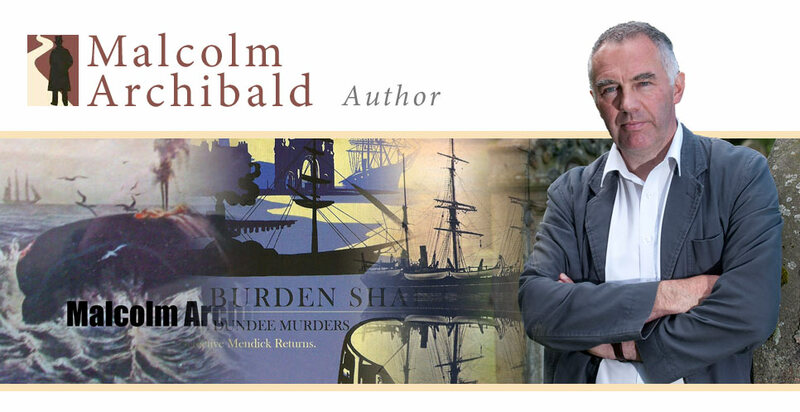 "Archibald's blend of nineteenth century science, history and adventure proves to be an extremely palatable concotion that is sure to entertain historical fiction lovers." "I would recommend this book. It is a real edge-of-the-seat read, with a whiff of villainy and a strong dose of romance. Matthew is an unassuming yet valiant hero, and Kate makes a marvellous heroine: outspoken and brave, but with an interesting vulnerability and her own demons to fight. I would look forward to their future adventures.'" "A rip-roaring adventure mystery with terrific detail of place, period and shipping lore." 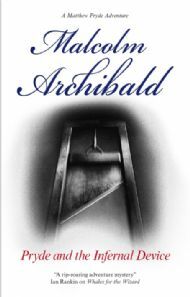 "Archibald breathes the spirit of Scott and Stevenson into this hit-the-deck-running mystery." "The author's style is objective, informative and entertaining...this remarkably competent book is not a dry industrial or economic history...its contribution to maritime history will be welcomed by those who are fascinated by the search for whales." "A definite one to have close to hand for those rare spare moments." "An amazingly eccentric collection or anthology of the sea and seafaring, this book introduces a fascinating repository of sealore, legend and history. 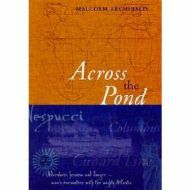 Delightfully illustrated it roams widely all over the world and practically throughout history. It never fails to educate, entertain and edify the reader. A fascinating little book whose author and publisher deserve considerable praise for producing it. A delight!" 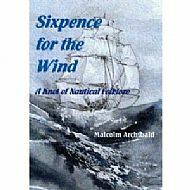 "Another delightful and eccentric compendium of sealore from Scotland’s dynamic duo, author Malcolm Archibald and publisher Whittles. Covering the history of Atlantic seafaring from 750BC until 1999, the book describes activity in every kind of craft coracles to yachts and from submarines to dreadnoughts, in both war and peace. Excitingly written and usefully illustrated, the book describes just about every imaginable nautical activity that has taken place in the Atlantic Ocean. It describes those activities very well. A great summary of one endlessly fascinating subject."